Hare, important to humans since our early days, is known everywhere as a symbol of fertility, balance, and transformation. Although rare, cave paintings of Hare have been found. With Hare comes the Spring promise of the eternal renewal of life. Hares and rabbits are quite different. Known as jackrabbits in America, hares are larger than rabbits, have longer ears, live longer, and always have black markings in their fur. Their mating and birthing practices are also different. Unlike rabbits who are born furless and sightless, hare babies (leverets) are born with a full coat of fur and good vision. 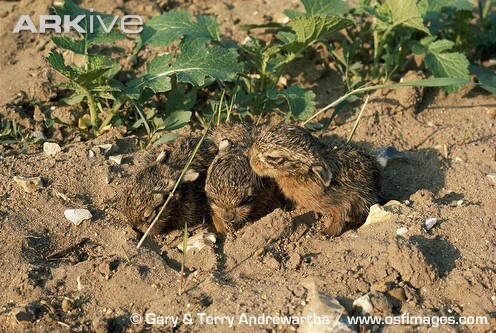 While rabbits birth their babies in underground burrows, hares birth their babies above ground in a patch of flattened vegetation called a form. Hares are extremely fertile, breeding from January to August. The doe births several broods a year of 2 – 3 leverets. Research is still ongoing concerning a process called Superfoetation – the development of fertilized eggs of two different ovarian cycles – in which a doe can become pregnant while already pregant. The first cycle leverets are born after 45 – 50 days. Meanwhile the doe is already advanced with a second pregnancy. Hares are very independent with little attachment to their young. The leverets have their own individual form and are visited once a night by their mother until they are weaned at six weeks. If left motherless they can usually survive. Hares often live alone or sometimes with a mate but they do not mate for life. 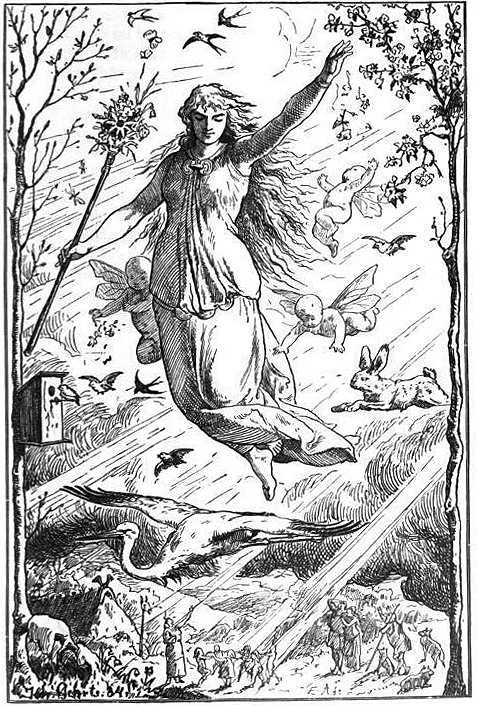 Though there is some doubt as to the actual existence of the Germanic Eostra (Saxon counterpart, Ostara) this goddess has become emblematic of the Spring Equinox and Easter. Often portrayed with a hare’s head or a white hare by her side, her name is thought to mean, “East”, “Shining”, or “Dawn.” It was believed that with the change of seasons Eostra’s hare laid eggs, symbolic of spring and the renewal of life. The Germanic goddess, Holda or Holle, was accompanied by torch bearing hares. A fertility goddess, she reigned in the long winter months, lighting the way from darkness to light. 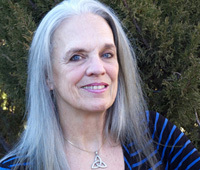 Myth recounts that she lead women on nocturnal, shamanic journeys. Hare, portrayed on Greek wedding rings and glass wedding bowls, is associated with various Greek deities – Aphrodite, Goddess of Love, Artemis, Goddess of Wild Places, and as companion to Cupid. 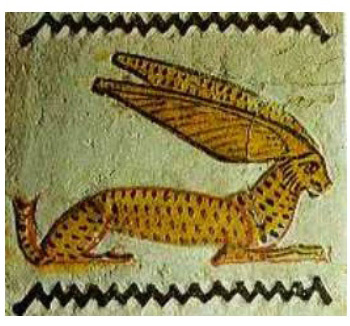 In Egypt Hare was connected with the very essence of being. 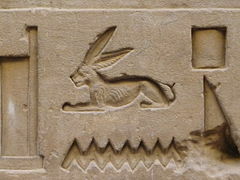 The hieroglyph “Wn” shows a hare above a ripple of water, the substance from which life comes. The god Osiris appeared at times with a Hare head. In this aspect he was called Un-nefer. A hare, representing Un-nfer, was sacrificed every spring to promote the annual flooding of the Nile. The ancient Egyptian Hare Goddess, Wenet, was depicted as a hare greeting the dawn, ushering in the new day. Egyptians wore hare amulets in life for fertility and in death for rebirth. Hare images are often found in triplicate – symbolic of birth, death and rebirth. The Celtic “three hare” design is thought to be linked to a similar design found in Buddhist cave temples dating back to 581-618 CE. Variations of this design are found across the Celtic world. Hare is a nocturnal creature – eating and traveling at night, resting during the day. In Britain during nights of old, one could see a meadow full of grazing hares, illuminated by the light of the moon. Many mythologies associate Hare with the moon. Instead of a man in the moon, folks in Mexico, China and Japan see a hare. 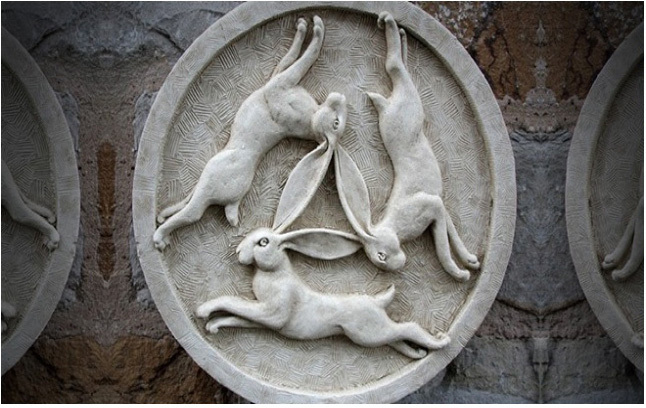 Chinese folklore connects Hare’s association with fertility to the moon. It was believed that a doe conceived through the touch of moonlight, by crossing water under a full moon or by licking moonlight shining on a male hare. Kaltes, Siberian Moon Goddess, was a shapeshifter often appearing as Hare. She was associated with childbirth and the beginning of life. Hare mates in the border spaces between forest and field. Hares Boxing – female fends off unwanted attention or evaluates male’s acceptability. Hare leaps high, moving quickly and erratically when evading a predator. With long, powerful hind legs, the ability to run up to 45 mph and to disappear quickly Hare’s association with transformation is strong. In European and Egyptian folklore Hare was believed to be androgynous, shifting back and forth between male and female. This belief endured into the 1800’s in Ireland, Wales and England. 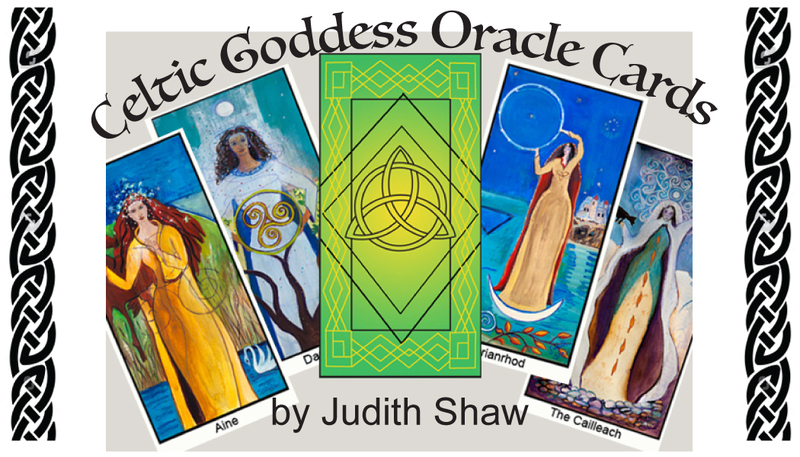 Celtic mythology associates hare with the Otherworld – those places found outside of normal time and space. In one legend Oisin, the famous warrior poet wounded a hare in its leg while hunting. He followed it into a thicket where upon he found a door leading into the Otherworld. He entered a beautiful hall and found a comely young woman sitting on a throne bleeding from a wound in her leg. In the story of Cerridwen, Celtic Goddess of Transformation, she pursued Gwion Bach in anger after he accidentally consumed her magic brew. They both underwent many transformations during the pursuit including Gwion’s shift into Hare. Messenger for Greek God Hermes, Egyptian God of Learning, Thoth, and Chinese Moon Goddess, Ch’ang O, Hare was a spirit messenger and a source of inspiration and enlightenment to many. The Celts studied Hare’s tracks, mating dances and entrails for divination. Hare was sacred to Andraste, British War Goddess who studied Hare’s movement for divination. Chinese mythology depicts Hare with a mortar and pestle mixing the elixir of immortality. Native American lore of many Northeastern tribes viewed Hare as Creator. In this aspect Hare is known as Nanabozho who created Earth, and brought light, fire, and sacred ritual to humankind. In other tales Hare is seen as a clown, a thief and a lecher. Hare’s younger brother Wabosso became the greatest magician of the supernaturals. Southern Native American tribes knew Hare as a trickster. African hare tales arrived in North American with the slave trade and mingled with Hare lore of these tribes, becoming the comic Br’er Rabbit of the South. With clown-like antics Hare brought down the prideful and outwitted enemies. The Japanese and Chinese see Hare as a symbol of luck and long life. When Hare appears a time of fertility, new life, new beginnings, and the ability to move forward with strength and independence is at hand. Hare calls for balance, intuition and an openness to inspiration. Hare reminds us not to take ourselves too seriously or we might just get tricked. Stay open to luck appearing where you least expect it. Hare awakens us to the promise and beauty of Spring and the eternal renewal of being. What a wealth of information, lore, and beauty! Thank you! Thanks Elizabeth. Funny thing happened to me. I’ve known about other cultures seeing the hare in the moon but I could never quite see it. Right after finishing up this post I saw the hare in the moon for the first time. Exciting! That is exciting! I have a friend who is a student of Chinese culture. One of her nicknames is Moon Rabbit. I look forward to taking a fresh look at the hare in the moon. Elizabeth – I think that once you see it you’ll never unsee it. A whole hare encyclopedia to read first thing in the morning! Majorly cool. I was aware that hares and rabbits are different, but that’s about all I knew until now. Your research is as good as your art. Brava! Judith – very interesting information on the double pregnancy of the doe… I do love rabbits. For me though their appearance seems to correspond to an experience oft he void… these animals are living stories and carry complex massages. Thanks! Sara, it is very interesting. I guess the verdict is still out as to whether or not the double pregnancy is real. I think their corresponding to an experience of the void fits right in with the Egyptian hieroglyph “Wn” expressing the very essence of being. Thanks Judith. I wonder if these images and stories also pertain to rabbits. That’s what we have here. Or had – a virus came along two years ago and wiped out the rabbits in our area. I can easily relate to: “With clown-like antics Hare brought down the prideful and outwitted enemies.”. Clowns are under appreciated as moral teachers. Western society seems to have made hares and clowns into superficial “toys”. I’m glad to see this is being changed. Perhaps it will lead us to respect life and value it in all creatures. Barbara you are correct that many of the stories pertaining to rabbit and hare are similar. But there are enough differences in their behavior and particularly their symbolism that made me feel the need to cover them separately. Look for a painting and story devoted to Rabbit in the future. In the same way Crow and Raven are very similar yet with slightly different behavior. But as their symbolism was so similar I combined those two together in my story. Interestingly enough I am finding that the honing down of info on many animals is as confusing as was the same process with the Celtic Goddesses. I agree, as we become more aware of each being’s beauty and worth we can create a better world. And of course clowns are a very important part of many Native America traditions as teachers and tricksters. I look forward to your post on rabbit. The only stories I know are “Peter Rabbit” and “the Easter bunny”! I seem to remember a post in the past that featured rabbit.